On January 15, 2019, the Nacimiento Regional Water Management Advisory Committee (NRWMAC) filed a lawsuit against Monterey County, the Monterey County Board of Supervisors, the Monterey County Water Resources Agency (MCWRA), et al., in San Luis Obispo County Superior Court. The suit alleges that the defendants violated their obligation to operate Lake Nacimiento Reservoir in such a way so as to provide sufficient water levels for recreation. The suit further alleges the defendants did not provide all the documents responsive to a Public Records Act request concerning communications and court filings related to the lake. And the suit seeks injunctive relief to prevent the defendants from continuing to release more water than it is allowed to under permits issued by the California State Water Resources Control Board (State Water Board). NRWMAC alleges that property owners have been damaged in an amount not less than $120 million, a figure that is based on an economic analysis considering multiple factors. To the extent that the $120 million is recovered, it would be distributed amongst NRWMAC’s constituents whose property values have been diminished by the loss of recreation on the lake. Also, on January 18, 2019, NRWMAC lodged a complaint with the California Environmental Protection Agency (Cal EPA) alleging that MCWRA diverted more water from Lake Nacimiento than permitted by the State of California, which limits withdrawal of water from the lake to 180,000 acre-feet per year. Based on publicly available data, it appears that 184,626 acre-feet was released from the lake during the period from October 1, 2017 through September 31, 2018. This amounts to 4,626 acre-feet more than was allowed. The complaint further alleges that the reduction in the level of water in the reservoir has adversely affected the quality of the water for domestic use. The State Water Board – Division of Water Rights, the State Water Board – Division of Drinking Water, and the State of California Central Coast Regional Water Quality Control Board are currently investigating NRWMAC’s complaint to Cal EPA. NRWMAC will provide updates during the pendency of the lawsuit and the investigation of the environmental complaints. If you value your recreation, water quality, way of life and property values, please donate to NRWMAC’s GoFundMe campaign today – even if you have previously donated. If you prefer you can privately donate using the nrwmac.org link below, or mail a check to NRWMAC at P.O. Box 398, Paso Robles, CA 93447. Now more than ever your donation will make a difference. Please share this with your friends, family and anyone you know that uses or cares about the lake, wildlife, and future of the lake. 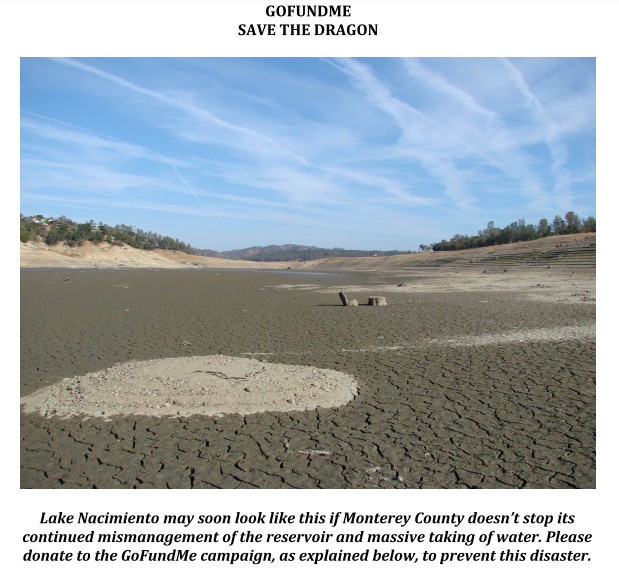 Lake Nacimiento, known as “The Dragon” because of its distinctive shape, is in extreme peril and needs your help. Millions of gallons of water are being taken out of the lake each day by Monterey County and sent north, primarily for the benefit of its farmers in the Salinas Valley, but also to support a fish habitat and to sell on the open market for profit. This isn’t simply “Water Over The Dam,” it is the moral equivalent of draining the life’s blood of The Dragon. Left unchecked, this massive release of water will devastate the local economy in San Luis Obispo County, where the lake is actually located, by curtailing recreation, depressing property values and reducing business and tax revenues. Although the farmers in the Salinas Valley are entitled to a fair share of the water, they are not entitled to ALL of it. There is no way of even knowing just how much water the farmers are getting, since much of it goes underground where it cannot be measured. It is also impossible to determine how much water, if any, is being wasted since that also defies measurement. What is clear is that ever since the time it completed a “divisionary facility” in Salinas, Monterey County has steadily increased the water it releases over the dam on a daily basis. Nacimiento Reservoir was originally designed and built by Monterey County for irrigation, flood control, groundwater recharge, and recreation. It was completed in 1957. Although the lake formed by the reservoir is entirely inside the geographical boundaries of San Luis Obispo County, the water is controlled by Monterey County under an operating license issued by the State of California. Over time, Monterey County has demonstrated that it does not care about the recreational aspect of its management of the lake, despite that component being of equal value to the others. Monterey County’s current attitude towards recreation at Lake Nacimiento borders on contempt. The Nacimiento Regional Water Management Advisory Committee (“NRWMAC”) was formed in the late1980’s to represent Lake Nacimiento property owners, visitors and enthusiasts in dealing with Monterey County’s management of this precious resource. During its tenure, NRWMAC has fought to maintain a consistent and appropriate water level of 748 feet above mean sea level (msl). At this level, during most years, there is enough water to satisfy the needs of the farmers, meet the California Department of Fish and Wildlife requirements for the fish habitat and concurrently sustain recreation throughout the peak summer months – at least through Labor Day of each year. For the most part, NRWMAC has been successful in its attempt to maintain a mutually acceptable lake level. Lately, however, Monterey County has been promulgating the notion that a lake level of 730 feet msl will sustain recreation. This is absolutely not true. At that level, launch ramps and docks along the lake become unusable, and previously submerged rocks, tree stumps and islands start surfacing, posing hazards to boating. NRWMAC has tried to negotiate a reasonable compromise with Monterey County over the lake level. Monterey County, however, will not negotiate. NRWMAC drafted and circulated a petition demanding a reduction to the massive and unreasonable daily water releases. This petition garnered over 6,000 signatures, and was presented to Monterey County in May of this year. Monterey County dismissed the petition, labeling it “factually inaccurate,” although it failed to explain how it was inaccurate. NRWMAC Directors have been on radio and television, and in print media, appealing for restraint over the water releases, but these effort have had no effect: Monterey County continues to drain the lake at its sole and unbridled discretion. Finally, as a last resort, and responding to the entreaties of its constituents, NRWMAC has been forced to retain a law firm experienced in water rights, and a team of hydrologists, to seek a legal remedy to halt the excessive outflow of water. NRWMAC has exhausted nearly its entire operating budget by subsidizing the legal fees to date and now it needs your help. NRWMAC has started a GoFundMe campaign to replenish the funds necessary to sustain its legal challenge. It is estimated that a minimum of $100,000.00 is required to continue forward and resolve this issue. Please contribute whatever you can to help NRWMAC Save the Dragon, and please share this GoFundMe link and web site to everyone on your mailing list. Discreet donation is available by checking the “Hide name and comment..” check box on the GoFundMe form, or use the donate buttons on the NRWMAC.Donate page located here www.nrwmac.org/donate . NRWMAC is a non-profit organization. Because of the way it is structured, donations made to it, or to the legal fund it is sponsoring, are not tax deductible to the donor. For more information on NRWMAC, how it supports Lake Nacimiento, and to join its growing list of supporters. 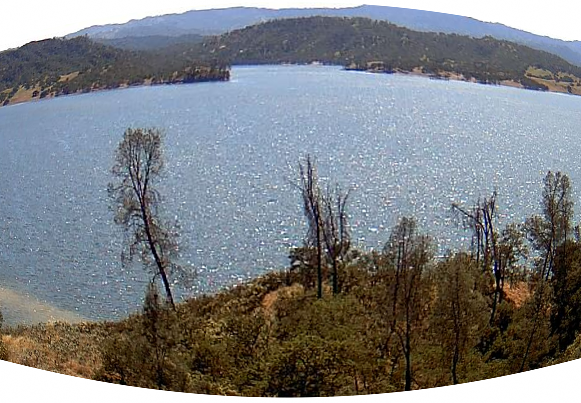 The Nacimiento Regional Water Management Advisory Committee (NRWMAC) represents property owners, visitors and enthusiasts of all sorts that enjoy Lake Nacimiento. Our goal is to maximize the water level in Lake Nacimiento throughout the summer. Res Ops Meetings and NRWMAC’s Board meetings are the last Thursday of the month. Maintenance of constant lake levels from May 1 through September 30 to enhance recreation activities and fish habitat. If the tunnel is built, utilize transferred water from Nacimiento, being stored in San Antonio, prior to releasing water from Nacimiento. What does NRWMAC do for you? NRWMAC saw early on that the Quagga Mussel could be the end of our beautiful lake. We visited contaminated lakes as far away as Lake Mead to see the damage done. 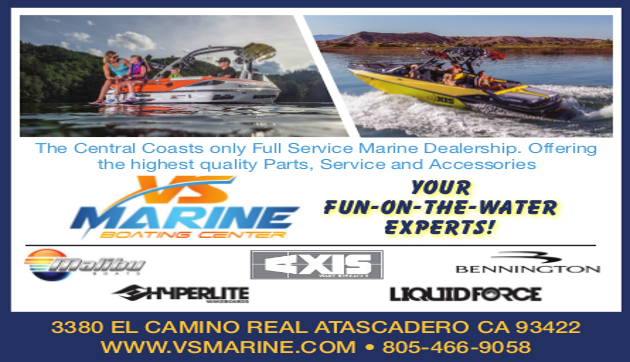 We, in conjunction with SLO County, and Monterey County, created a plan and we train all inspectors for all boats entering our lake. Our plan is updated yearly and the training is on -going. This alone is nearly a full time (unpaid) job. NRWMAC has brought back the idea of a pipeline between Nacimiento and San Antonio, as another way to manage the amount of water stored. This idea has been taken up by Monterey County, who has designed their own version, …much different from NRWMAC’s vision. Their version may not benefit Lake Nacimiento owners and enthusiasts. This promises to be an expensive process and a lengthy series of meetings and we will need your help. NRWMAC supports the rights of all of the property owners and recreational enthusiasts. At Lake Nacimiento. DON’T LET OUR LAKE GET INFESTED!! The Nacimiento Regional Water Management Advisory Committee (NRWMAC) represents property owners, visitors and enthusiasts of all sorts that enjoy Lake Nacimiento. Our goal is to maximize the water level in Lake Nacimiento throughout the summer. The SLO County Health Dept. warns fishermen to be careful of what they eat. The greatest threat to private property and recreational facilities is a fire. Over the last two years the Lake Ranger staff has been drastically reduced. For different live views from around the lake, have a look at a few of our web cams.